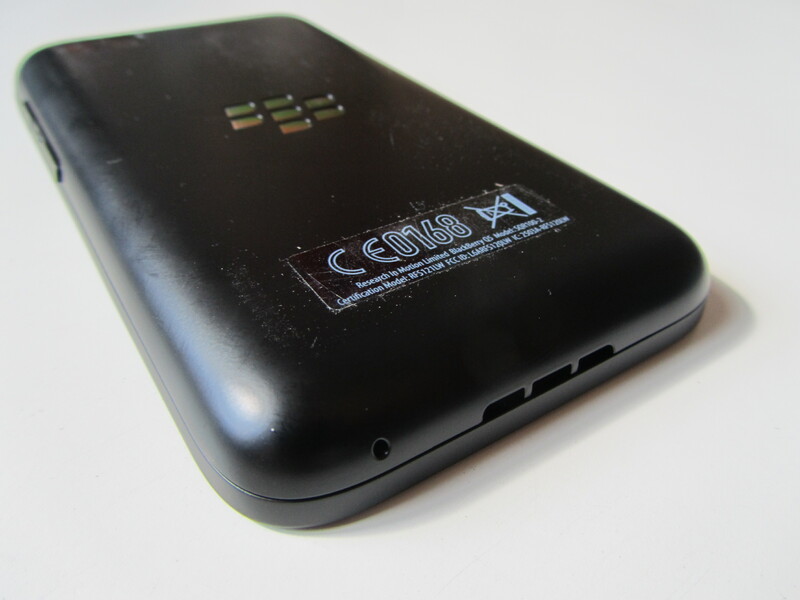 BlackBerry Q5 review: Can BlackBerry's mid-range best the rest? 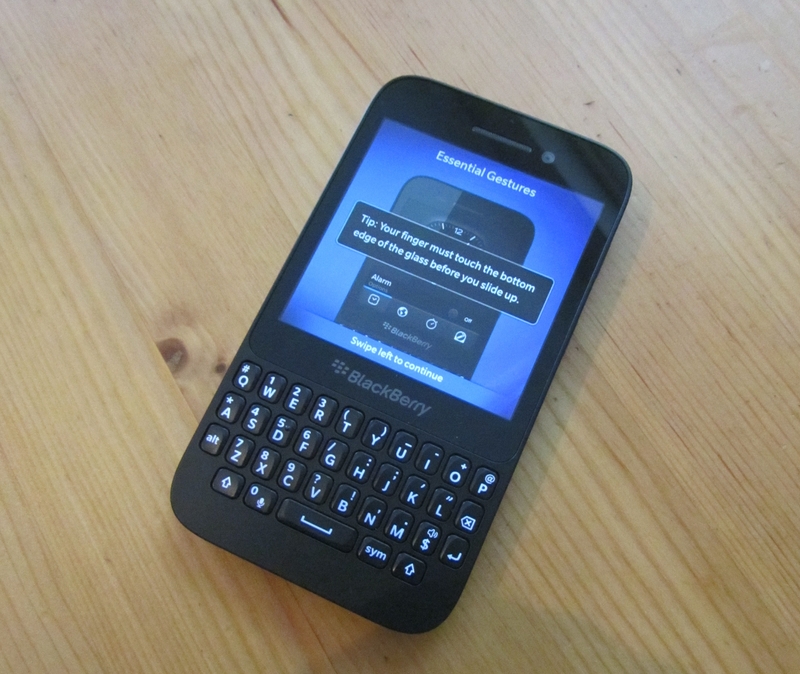 BlackBerry Q5 review: Can BlackBerry’s mid-range hopeful best the rest? BlackBerry has been getting a tough ride of it in the consumer press for the last few years, and for good reason – the majority of its releases have been at best forgettable, and at worst broken. Remember the Storm? Yeah, best forgotten. But that was then and this is now. BlackBerry 10 is here and the company already has two range topping handsets in the form of the full touchscreen Z10 and the Qwerty-equipped Q10, and now, the middling Q5. 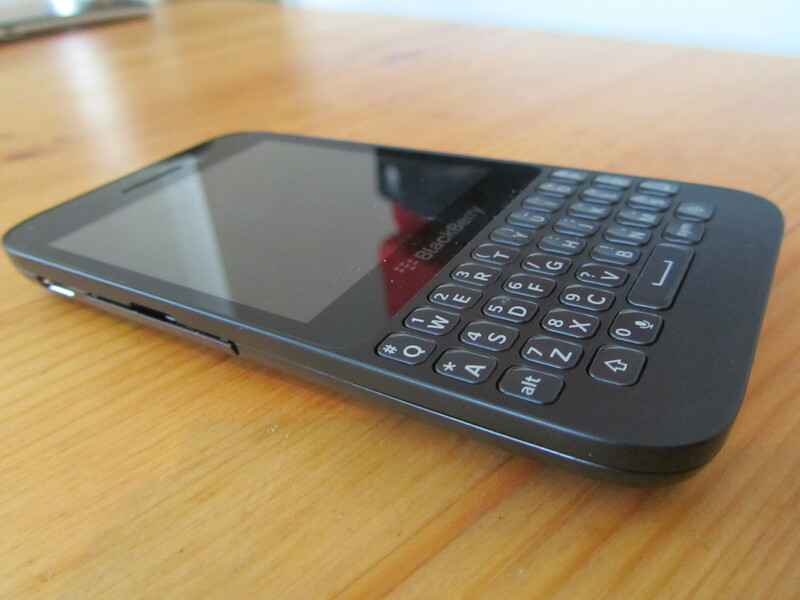 Like the Q10, the Q5 has BlackBerry’s much-beloved Qwerty, but unlike it, it comes in at a lower price point. Increasingly, it’s the middle ground where handset makers are fighting it out. Look at what Samsung has announced this year, one hero device in each product family and many, many iterations on it. But with few recent consumer wins to draw on can BlackBerry’s Q5 provide enough of a lure to draw customers’ eyes away from their rivals’ wares? Buying a budget handset comes with concessions, and with the Q5, simply picking up the phone brings the first. It doesn’t feel like quality. It’s not that it feels badly made, quite the opposite, the curvature and fit on the rear panels gives the phone a good in-hand feel, but it reeks of anonymous dull black plastic. In fact, the entire outer shell is plastic making it sort of slippery to hold, if I was feeling kind, it could be described as a satiny feel. It’s not the lightest either (official specs peg it at 120 grams), not too heavy but not the lightest – which is surprising given all the plastic. Look, let’s be honest, if you’re considering buying the Q5 it’s at least partly because you like the idea of having a Qwerty keyboard. Perhaps you were a BlackBerry user in the past and are keen to get back on board, or perhaps you’re upgrading from a feature phone with an inferior Qwerty. If you’re one of those people then you’ll likely enjoy using the Q5’s. For me, that time has passed. I never owned a Curve, or a Bold. Part of the problem is that the predictive text system on BlackBerry 10 is so damn good, but with the Q5, unlike the Z10, there’s no intuitive in-line flicking up of the predicted word from the middle of the screen. Instead, you’re switching from typing using the keyboard to selecting it from an on-screen horizontal bar above the Qwerty, which, to be fair, is what most other native predictive text systems use. 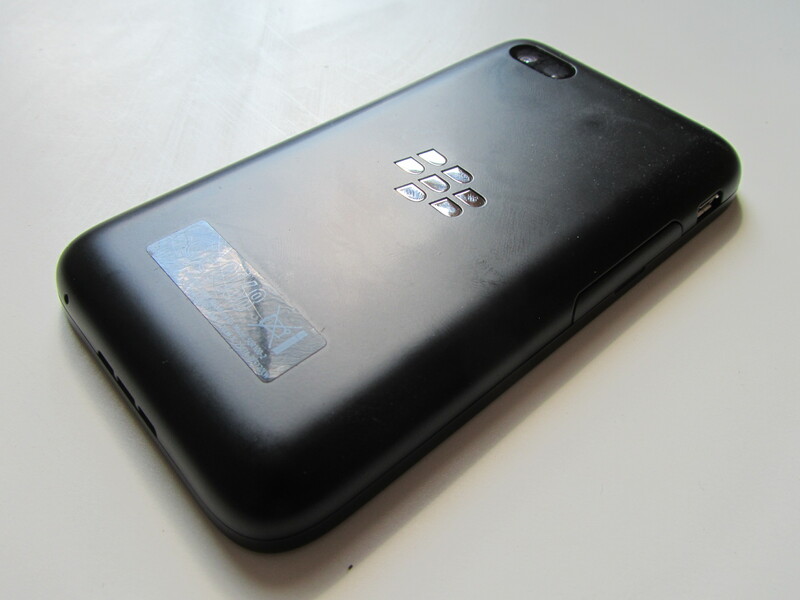 The Q5 uses the BlackBerry 10 operating system found on the Q10 and Z10, which personally I like. However, there are caveats. While I like the whole ‘peek and flow’ navigation – the way you swipe up and to the right to peek at your messages via the BlackBerry hub – it could be a little more refined. For example, if you see you have a notification via the red light flashing, peeking at the Hub returns you to whatever you were doing last, rather than an overview of your accounts. The Hub is actually pretty handy, it gives a quick overview of all your messages, calls, emails, BBM notifications etc. in one place. If there are a few crucial apps that you rely on day-in, day-out then you should probably look elsewhere, BlackBerry World almost certainly won’t have it. 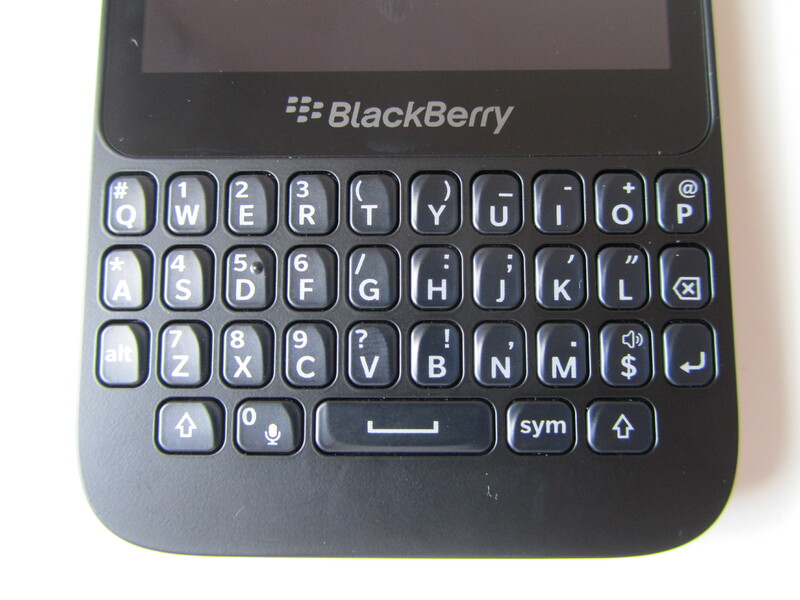 In general the selection isn’t the best, but for the Q5 (and Q10) it’s even worse. Because it uses a different aspect ratio for the display, developers need to make minor tweaks to apps to better fill the screen and not all of them have. However, it does have one software feature I love, and that’s the ability to just start typing directly from the home screen to compose a tweet or a Facebook update. It really is as straight-forward as it sounds, start typing anything and the OS searches the phone for that phrase, word or app. 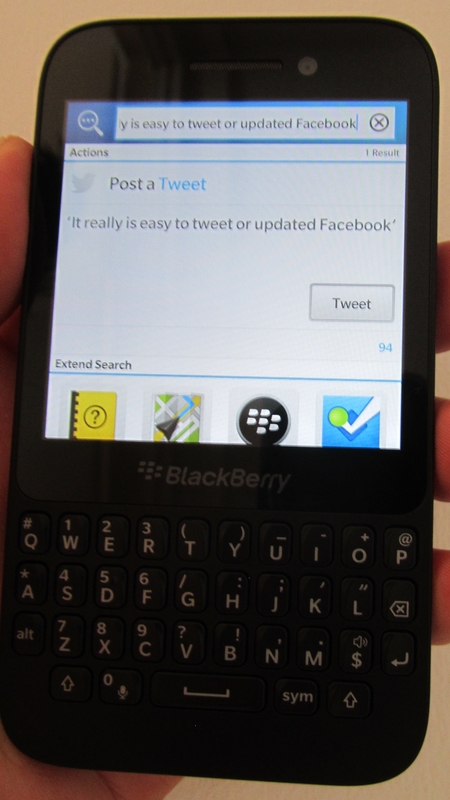 Start typing with the word tweet, or Facebook however, and it’ll automatically start composing the update without you needing to do anything else or quit whatever you were doing before. It does only work from the home screen, though. There’s also the BlackBerry Messenger (BBM) system on board that seems to have struck a chord with the ‘yoof’ crowd in recent years thanks to its inherently secure nature. As on other recently released BlackBerry 10 devices, you can also use BBM for video and voice calls, as well as sharing whatever is on your screen with the other person, which while pretty neat, I wouldn’t see myself using very often. In some ways the Q5 can be a contradiction, the screen for example, while not large enough for my tastes (I have become used to an expansive full touchscreen’s ways) is bright and crisp. Likewise, it has 4G connectivity, which some better specced phones on the market do not. Its 1.2GHz processor pits it at a decidedly mid-range point, but I didn’t notice and lag or stuttering when using the phone, so it’s ample for my needs at least. However, in other ways it’s obvious where the money has been saved. 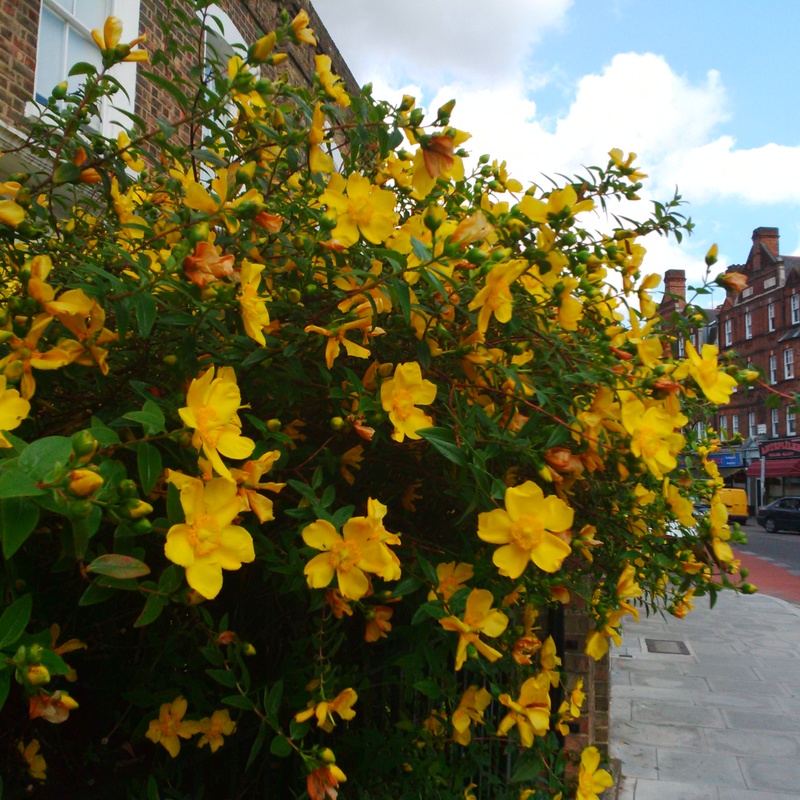 The camera for example (a 5-megapixel, making it a slight drop from the 8-megapixel found in the Q10 and Z10) is decidedly average. If it was my only camera, I’d often be disappointed with the pictures I’d have. As with many middling (and some more expensive) smartphones, if it’s sunny and you want to take a macro shot, you should be okay, but if it’s remotely dingy, forget about it. Almost every shot will be one to delete. This is about as good as it gets for the camera. Let’s be honest, the phone isn’t really made as a media consumption device, sure you can play back music and videos, but with a small screen and a small chassis the viewing and listening experience won’t be the best. Still, it’s hard to hold that against a handset that clearly isn’t designed with that as its primary purpose. 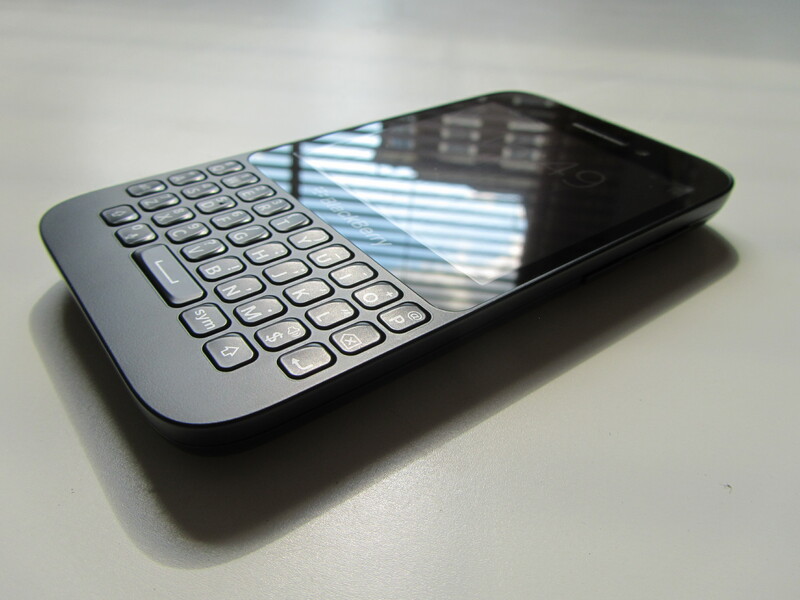 If you’re a historic fan of BlackBerry or desperately want to have that Qwerty keyboard then the BlackBerry Q5 would likely make you very happy indeed. If that doesn’t sound like you, it’s probably best to look elsewhere. The problem with the Q5 isn’t that it’s a bad phone, it’s that it’s too expensive for a mid-range phone and doesn’t deliver on the usual consumer features, such as photography and video playback. Where other manufacturers have been working hard to augment their devices and platforms with bespoke apps and services in this area, BlackBerry has been playing catch up just to be in the game, and it shows. At around £370 SIM-free in the UK, the Q5 is a well built if somewhat anonymous looking handset whose success will ultimately likely be crippled by its pricing, rather than its spec list.